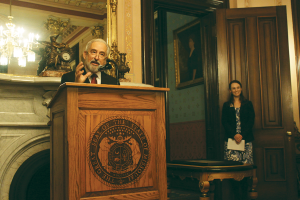 Gary Kremer, SHSMO executive director, addresses guests at the Bicentennial Alliance signing event on January 8 at the Governor’s Mansion. Kremer’s remarks followed a welcome from Missouri First Lady Dr. Sheena Greitens, standing at right. The Bicentennial Alliance, a coalition of statewide organizations and government agencies, celebrated its official launch at the Governor’s Mansion in Jefferson City on January 8. The alliance, which will foster collaboration and cooperative efforts to commemorate Missouri’s bicentennial in 2021, emerged out of the State Historical Society of Missouri’s work with other institutions through the Missouri 2021 initiative. Other partners participating in the Bicentennial Alliance include the Kinder Institute on Constitutional Democracy at the University of Missouri, the Missouri Council for History Education, the St. Louis–based Missouri Historical Society (formerly the Missouri History Museum), the Missouri Humanities Council, and the Missouri State Archives. At the January 8 event, Missouri First Lady Dr. Sheena Greitens noted that the bicentennial marks a significant historical milestone beckoning Missourians to reflect upon their heritage. Gary Kremer, SHSMO’s executive director, said the bicentennial provides an opportunity for exploring and promoting the intricate history and wide range of cultures found among Missouri’s local communities. Learn more about the Bicentennial Alliance and planned projects and find us on Facebook. Missouri 2021 is excited to share that grants are available if you are looking for funding to start your observances of the bicentennial of Missouri’s statehood in 2021! The State Historical Society of Missouri announced it will offer funding in 2018 to local Missouri cultural heritage institutions in support of their efforts to preserve historic material and provide programming on local history topics, including bicentennial projects. SHSMO will award up to $500 per calendar year, per organization, through Brownlee Grants, named in memory of Dr. Richard S. Brownlee, the Society’s executive director from 1960 to 1985. A maximum of $5,000 in total grants will be awarded in January, and the grant period will run through the end of 2018. SHSMO is accepting applications now through December 15 for projects in one of three focus areas: historical records preservation, educational or programming activities, and observances of the bicentennial of Missouri’s statehood in 2021. Grants are available to Missouri cultural heritage institutions, and preference will be given to local historical societies. 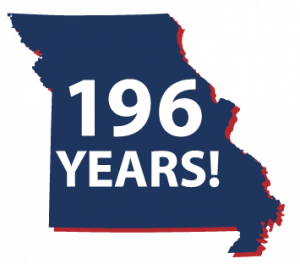 Today marks Missouri’s 196th anniversary of statehood and places us one year closer to the Missouri Bicentennial in 2021. Missourians are a dynamic, innovative, and persistent group of people. From the river valleys to the Ozark Mountains and from the rich farmlands to the urban centers, Missouri has bred, welcomed, and challenged individuals. Builders, farmers, explorers, scientists, leaders, and artists of all kinds have risen to the occasion, enriching the Show-Me State we know today with their contributions. 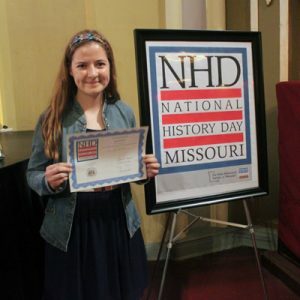 The Missouri Bicentennial provides a once-in-a-lifetime occasion to consider, commemorate, and celebrate the history and culture of the state and the unique role of its many and diverse communities in shaping its past, present, and future. 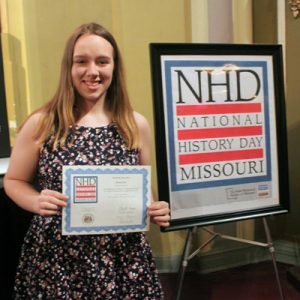 Encouraging people to consider their own Missouri story, the State Historical Society of Missouri is creating projects aimed at engaging all Missourians. The mission of Missouri 2021 is to promote a better understanding of Missouri, its regions, communities, and people, both past and present. The bicentennial of Missouri statehood will provide opportunities for citizens to celebrate and explore the rich history and diversity of the state and to share their unique perspectives. Thank you for your continued support and interest in the Missouri Bicentennial. Stay up-to-date on the planning process and ways you may be involved by subscribing to emails. You can also follow Missouri 2021 on Facebook to learn more about the Show-Me State. Michael Sweeney, the Society’s new bicentennial coordinator. Michael Sweeney has been appointed to spearhead the Society’s efforts to commemorate Missouri’s state bicentennial in 2021. Sweeney, who served as a staff historian and senior research specialist at SHSMO’s Kansas City Research Center from 2015 to 2016, is based in Kansas City. Sweeney rejoins SHSMO after a stint as director of collections at the American Jazz Museum in Kansas City. 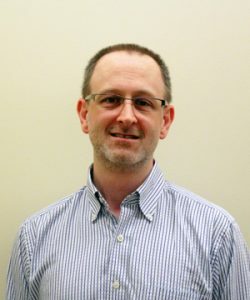 He holds a PhD in American Studies from the University of Kansas and a master’s degree in library and information science from the University of Missouri. “His depth of knowledge about Missouri history and his ability to build partnerships make Michael the ideal candidate to coordinate the Society’s plans for the bicentennial,” said Gary Kremer, SHSMO executive director. Sweeney has quickly advanced the vision for the celebration by laying groundwork throughout the state. Crisscrossing the state for meetings, he has met with potential partners in Missouri’s urban centers and rural communities. Please join the Bicentennial Committee in congratulating Jakob Palmer, Hannah Scott, and Sarah Worthley! 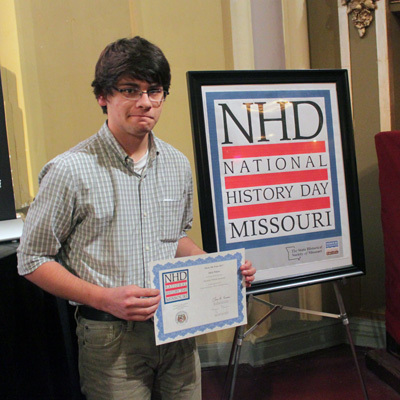 Palmer’s senior division documentary, Alexander William Doniphan; Scott’s senior division exhibit, The Safekeepers of History: A Monumental Stand for Cultural Preservation During World War II; and Worthley’s senior division website, That’s Nuts: A Man’s Stand For Growing Generosity, were selected as the 2017 Show-Me Prize Winners at the National History Day in Missouri state contest on April 29. The award, established in 2014, is presented to the best individual senior division entry in any category that showcases a significant development in Missouri history or demonstrate how a Missourian contributed to significant events in national or international history.